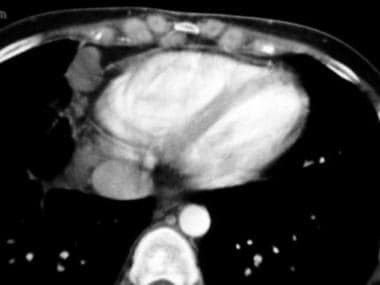 Search for extracardiac manifestations of a systemic disorder that may cause secondary restrictive cardiomyopathy (eg, hemochromatosis, amyloidosis, sarcoidosis, or scleroderma). See Clinical Presentation for more detail. See Workup for more detail. RCM has no specific treatment. However, therapies directed at individual causes of RCM have been proven to be effective. See Treatment for more detail. RCM may be idiopathic or secondary to other diseases (ie, amyloidosis and endomyocardial disease with or without hypereosinophilia). The course of RCM varies, depending on the pathology and treatment. RCM has been found to be a significant cause of heart failure with preserved ejection fraction, although there is a high clinical overlap between RCM and other forms of heart failure. RCM therefore presents a diagnostic challenge, and multiple modalities are usually required to make a final diagnosis. Restrictive cardiomyopathy. 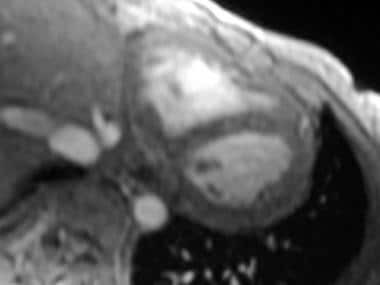 Axial double inversion-recovery magnetic resonance image of the heart in a 30-year-old woman with sarcoidosis demonstrates a normal pericardium. Restrictive cardiomyopathy. Axial contrast-enhanced computed tomography scan through the heart (same patient as in the previous image) shows a thin pericardium without calcification. Note the cardiophrenic and internal mammary lymph nodes. The patient had extensive mediastinal and hilar adenopathy, as well as interstitial lung changes. Patients typically have reduced compliance (increased diastolic stiffness), and the left ventricle cannot fill adequately at normal filling pressures. Reduced left ventricular filling volume leads to a reduced cardiac output. Early in the disease process, systolic function usually remains normal. Wall thickness may be increased in cases of infiltrative processes such as amyloidosis, but the increase is usually not as pronounced as that observed in hypertrophic cardiomyopathy. As the disease progresses, a variable reduction in systolic function may develop with symptoms of reduced cardiac output, such as fatigue and lethargy, becoming evident. Increased filling pressures can manifest as pulmonary and systemic congestion. RCM affects both ventricles and therefore may cause signs and symptoms of both left-sided and right-sided heart failure. Some patients may have complete heart block as a consequence of fibrosis encasing the sinoatrial or the atrioventricular nodes. Based on pathology findings, RCM can further be classified as obliterative (ie, thrombus-filled ventricles) or nonobliterative. Idiopathic (primary) RCM is nonobliterative, as progressive fibrosis of the myocardium occurs but no thrombus forms. This entity also is said to lack specific histopathologic changes. Obliterative RCM is very rare. It may result from the end stage of the eosinophilic syndromes, in which an intracavitary thrombus fills the left ventricular apex and hampers the filling of the ventricles. The fibrosis of the endocardium may extend to involve the atrioventricular valves and cause regurgitation. Two forms of endomyocardial fibrosis (EMF) exist—an active inflammatory eosinophilia and chronic EMF. Restrictive cardiomyopathy (RCM) may be caused by various local and systemic disorders; many of them are rare and unlikely to be observed in the United States. The specific pathophysiologies of the more common causes of RCM will be described in detail below. A subset of patients has heart muscle disease of unknown cause that is manifested by heart failure and restrictive hemodynamics, but without significant ventricular hypertrophy, endocardial thickening or fibrosis, associated eosinophilia, or other diagnostically distinct histopathologic changes. In addition to the presenting symptoms of right- and left-side heart failure, as many as one third of patients with idiopathic RCM may present with thromboembolic complications. Pathologically, these patients have strikingly dilated atria, which may account for the increased cardiothoracic ratio on chest radiography. Echocardiography shows bilateral atrial enlargement with normal ventricular size but significant diffuse left ventricular hypertrophy, especially with amyloidosis. Histologic features include interstitial fibrosis, which is minimal in some patients and extensive in others. EMF is the most common global cause of RCM, affecting an estimated 12 million people worldwide. This condition is observed in equatorial Africa and, less frequently, in tropical and subtropical Asia and South America. EMF was originally believed to be the end stage of eosinophilic endomyocarditis. However, chronic EMF is currently considered a separate entity because it does not exhibit eosinophilia. EMF demonstrates pathology that is similar to that of Loeffler endocarditis. The prognosis is poor for patients with diffuse involvement of the heart, but localized lesions involving the valves are amenable to surgical repair or removal and replacement. Amyloidosis is characterized by the multisystem deposition of proteins known as amyloid fibrils, and it typically presents as a systemic disorder, with infiltration of the liver, kidneys, bowel, nerves, skin, and tongue. Cardiac involvement is common and the major source of associated morbidity and mortality. The myocardial wall thickens and becomes firm, rubbery, and noncompliant as amyloid accumulates in tissues. These changes lead to abnormalities of contractility, conduction, and coronary blood flow. Interestingly, amyloid deposition in the bundle branches is rare. Biventricular diastolic dysfunction causes intracardiac pressures to rise, and it may progress to systolic dysfunction in advanced disease. The heart typically does not collapse when removed from the chest during autopsy. Primary or amyloid light-chain (AL): This is the most common form, often associated with multiple myeloma; prognosis is poor, with a median 1-year survival from diagnosis. Secondary amyloidosis or amyloid A (AA): This type is secondary to chronic diseases, especially inflammatory conditions. Senile amyloidosis or wild-type transthyretin (wt-TTR) amyloidosis: This form is seen in 25-36% of patients older than 80 years; it is caused by deposition of wt-TTR. The median survival is 6 years. Familial amyloidosis or hereditary mutant TTR (m-TTR)/hereditary transthyretin-derived (ATTR) amyloidosis: This type is a systemic autosomal dominant disorder due to tissue deposition of various proteins. Cardiac involvement is rare. The cardiac involvement in primary amyloidosis is most commonly associated with restrictive physiology. On histologic examination, amyloid may deposit within any part of the heart, including the myocardium, vessels, endocardium, valves, epicardium, and parietal pericardium. The ventricular walls are typically thickened, sometimes with disproportionate septal thickening, and may mimic the appearance of hypertrophic cardiomyopathy. Atrial dilatation develops as a consequence of increased ventricular filling pressures and restrictive physiology. Involvement of the valves may create regurgitant lesions, but a hemodynamically and clinically significant degree of regurgitation is unusual. Idiopathic restrictive cardiomyopathy (RCM) is observed primarily in the United States. Loeffler endocarditis is common in the temperate zone, whereas chronic endomyocardial fibrosis (EMF) is observed exclusively in tropical and subtropical Africa, Asia, and South America. EMF occurs most commonly in children and young adults in Uganda and Nigeria  ; this condition may account for up to one fourth of deaths due to cardiac disease in those areas. The course of RCM varies depending on the pathology, and treatment is often unsatisfactory. The prognosis is generally poor in the adult population, as RCM shows progressive deterioration. The natural history of RCM is especially poor in children with heart failure. Adults experience a prolonged course of heart failure and may have complications of cardiac cirrhosis and thromboembolism. Patients whose condition is refractory to supportive therapy usually die of low-output cardiac failure unless cardiac transplantation is an option. Kushwaha SS, Fallon JT, Fuster V. Restrictive cardiomyopathy. N Engl J Med. 1997 Jan 23. 336 (4):267-76. [Medline]. Merlo M, Abate E, Pinamonti B, et al. Restrictive cardiomyopathy: clinical assessment and imaging in diagnosis and patient management. In: Pinamonti B, Sinagra Gianfranco, eds. Clinical Echocardiography and Other Imaging Techniques in Cardiomyopathies. Cham, Switzerland: Springer; 2014. 185-206. [Full Text]. Huby AC, Mendsaikhan U, Takagi K, et al. Disturbance in Z-disk mechanosensitive proteins induced by a persistent mutant myopalladin causes familial restrictive cardiomyopathy. J Am Coll Cardiol. 2014 Dec 30. 64 (25):2765-76. [Medline]. Gonzalez-Lopez E, Gallego-Delgado M, Guzzo-Merello G, et al. Wild-type transthyretin amyloidosis as a cause of heart failure with preserved ejection fraction. Eur Heart J. 2015 Oct 7. 36 (38):2585-94. [Medline]. Schlant RC, Alexander RW, eds. The Heart. New York, NY: McGraw-Hill; 1994. 1637-45. Higano ST, Azrak E, Tahirkheli NK, Kern MJ. Hemodynamic rounds series II: hemodynamics of constrictive physiology: influence of respiratory dynamics on ventricular pressures. Catheter Cardiovasc Interv. 1999 Apr. 46 (4):473-86. [Medline]. Kostareva A, Kiselev A, Gudkova A, et al. Genetic spectrum of idiopathic restrictive cardiomyopathy uncovered by next-generation sequencing. PLoS One. 2016. 11 (9):e0163362. [Medline]. Towbin JA. Inherited cardiomyopathies. Circ J. 2014. 78 (10):2347-56. [Medline]. Peled Y, Gramlich M, Yoskovitz G, et al. Titin mutation in familial restrictive cardiomyopathy. Int J Cardiol. 2014 Jan 15. 171 (1):24-30. [Medline]. [Guideline] Lindenfeld J, Albert NM, Boehmer JP, et al, for the Heart Failure Society of America. HFSA 2010 Comprehensive Heart Failure Practice Guideline. J Card Fail. 2010 Jun. 16(6):e1-194. [Medline]. Davies MJ, Mann JM. Systemic pathology. The Cardiovascular System. Vol 10. New York, NY: Churchill Livingstone; 1995. 1409-16. Wald DS, Gray HH. Restrictive cardiomyopathy in systemic amyloidosis. QJM. 2003 May. 96 (5):380-2. [Medline]. Garcia MJ. Constrictive pericarditis versus restrictive cardiomyopathy?. J Am Coll Cardiol. 2016 May 3. 67 (17):2061-76. [Medline]. Sasaki N, Garcia M, Ko HH, Sharma S, Parness IA, Srivastava S. Applicability of published guidelines for assessment of left ventricular diastolic function in adults to children with restrictive cardiomyopathy: an observational study. Pediatr Cardiol. 2015 Feb. 36 (2):386-92. [Medline]. Bejar D, Colombo PC, Latif F, Yuzefpolskaya M. Infiltrative cardiomyopathies. Clin Med Insights Cardiol. 2015. 9 (suppl 2):29-38. [Medline]. Mankad AK, Shah KB. Transthyretin cardiac amyloidosis. Curr Cardiol Rep. 2017 Aug 24. 19 (10):97. [Medline]. Maleszewski JJ. Cardiac amyloidosis: pathology, nomenclature, and typing. Cardiovasc Pathol. 2015 Nov-Dec. 24 (6):343-50. [Medline]. Braunwald E, Abelmann WH, eds. Atlas of Heart Diseases. Vol 2. Philadelphia, PA: Current Medicine; 1994. 53-61. Niemann JI. Cardiomyopathies and pericardial disease. In: Tintinalli JE, Stapczynski JS, Ma OJ, et al, eds. Tintinalli's Emergency Medicine: A Comprehensive Study Guide. 8th ed. New York, NY: McGraw-Hill; 2016. 384. Castano A, Bokhari S, Maurer MS. Unveiling wild-type transthyretin cardiac amyloidosis as a significant and potentially modifiable cause of heart failure with preserved ejection fraction. Eur Heart J. 2015 Oct 7. 36 (38):2595-7. [Medline]. Goldstein JA. Differentiation of constrictive pericarditis and restrictive cardiomyopathy. ACC Ed Highlights. 1998 Fall. 14-22. Amaki M, Savino J, Ain DL, et al. Diagnostic concordance of echocardiography and cardiac magnetic resonance-based tissue tracking for differentiating constrictive pericarditis from restrictive cardiomyopathy. Circ Cardiovasc Imaging. 2014 Sep. 7 (5):819-27. [Medline]. Malik SB, Kwan D, Shah AB, Hsu JY. The right atrium: gateway to the heart--anatomic and pathologic imaging findings. Radiographics. 2015 Jan-Feb. 35 (1):14-31. [Medline]. Falk RH, Quarta CC. Echocardiography in cardiac amyloidosis. Heart Fail Rev. 2015 Mar. 20 (2):125-31. [Medline]. Leya FS, Arab D, Joyal D, et al. The efficacy of brain natriuretic peptide levels in differentiating constrictive pericarditis from restrictive cardiomyopathy. J Am Coll Cardiol. 2005 Jun 7. 45 (11):1900-2. [Medline]. Selvaganesh M, Arul AS, Balasubramanian S, Ganesan N, Naina Mohammed S, Sivakumar GS, et al. An unusual ECG pattern in restrictive cardimyopathy. Indian Heart J. 2015 Jul-Aug. 67 (4):362-7. [Medline]. White JA, Fine NM. Recent advances in cardiovascular imaging relevant to the management of patients with suspected cardiac amyloidosis. Curr Cardiol Rep. 2016 Aug. 18 (8):77. [Medline]. Saeed M, Liu H, Liang CH, Wilson MW. Magnetic resonance imaging for characterizing myocardial diseases. Int J Cardiovasc Imaging. 2017 Sep. 33 (9):1395-414. [Medline]. Leviner DB, Hochhauser E, Arad M. Inherited cardiomyopathies--novel therapies. Pharmacol Ther. 2015 Nov. 155:36-48. [Medline]. Gursu HA, Varan B, Erdogan I. Use of oral budesonide in the management of protein-losing enteropathy due to restrictive cardiomyopathy. Cardiol Young. 2014 Aug. 24 (4):764-6. [Medline]. Miller LW, Guglin M. Evaluation of ventricular assist devices and cardiac transplantation. In: Baliga R, Haas G, eds. Management of Heart Failure. London, UK: Springer-Verlag; 2015. Sundararajan S, Thiruchelvam T, Hsia TY, Karimova A. New 15-mL ventricular assist device in children with restrictive physiology of the left ventricle. J Thorac Cardiovasc Surg. 2014 Jun. 147 (6):e79-80. [Medline]. Grupper A, Park SJ, Pereira NL, et al. Role of ventricular assist therapy for patients with heart failure and restrictive physiology: Improving outcomes for a lethal disease. J Heart Lung Transplant. 2015 Aug. 34 (8):1042-9. [Medline]. Robinson MR, Al-Kindi SG, Oliveira GH. Heart and heart-liver transplantation in patients with hemochromatosis. Int J Cardiol. 2017 Oct 1. 244:226-8. [Medline]. Uriel N, Vainrib A, Jorde UP, et al. Mediastinal radiation and adverse outcomes after heart transplantation. J Heart Lung Transplant. 2010 Mar. 29 (3):378-81. [Medline]. Hanna M. Novel drugs targeting transthyretin amyloidosis. Curr Heart Fail Rep. 2014 Mar. 11 (1):50-7. [Medline]. Madeira M, Teixeira R, Costa M, Goncalves L, Klein AL. Two-dimensional speckle tracking cardiac mechanics and constrictive pericarditis: systematic review. Echocardiography. 2016 Oct. 33 (10):1589-99. [Medline]. Zhang Y, He L, Cai J, et al. Measurements in pediatric patients with cardiomyopathies: comparison of cardiac magnetic resonance imaging and echocardiography. Cardiology. 2015. 131 (4):245-50. [Medline]. Topilsky Y, Pereira NL, Shah DK, et al. Left ventricular assist device therapy in patients with restrictive and hypertrophic cardiomyopathy. Circ Heart Fail. 2011 May. 4 (3):266-75. [Medline]. [Guideline] Hershberger RE, Lindenfeld J, Mestroni L, Seidman CE, Taylor MR, Towbin JA, et al. Genetic evaluation of cardiomyopathy--a Heart Failure Society of America practice guideline. J Card Fail. 2009 Mar. 15(2):83-97. [Medline]. [Full Text]. Fritschi S, Prothmann M, Schulz-Menger J. [Hypertrophic and restrictive cardiomyopathy. Differentiation by imaging] [German]. Herz. 2015 Jun. 40 (4):591-9. [Medline]. DePasquale EC, Nasir K, Jacoby DL. Outcomes of adults with restrictive cardiomyopathy after heart transplantation. J Heart Lung Transplant. 2012 Dec. 31 (12):1269-75. [Medline]. [Guideline] Yancy CW, Jessup M, Bozkurt B, et al, for the Writing Committee Members, American College of Cardiology Foundation/American Heart Association Task Force on Practice Guidelines. 2013 ACCF/AHA guideline for the management of heart failure: a report of the American College of Cardiology Foundation/American Heart Association Task Force on practice guidelines. Circulation. 2013 Oct 15. 128(16):e240-327. [Medline]. [Full Text]. [Guideline] Ackerman MJ, Priori SG, Willems S, et al, for the Heart Rhythm Society (HRS), European Heart Rhythm Association (EHRA). HRS/EHRA expert consensus statement on the state of genetic testing for the channelopathies and cardiomyopathies: this document was developed as a partnership between the Heart Rhythm Society (HRS) and the European Heart Rhythm Association (EHRA). Europace. 2011 Aug. 13(8):1077-109. [Medline]. [Full Text]. [Guideline] Ponikowski P, Voors AA, Anker SD, et al, for the European Society of Cardiology Authors/Task Force Members. 2016 ESC Guidelines for the diagnosis and treatment of acute and chronic heart failure: The Task Force for the diagnosis and treatment of acute and chronic heart failure of the European Society of Cardiology (ESC)Developed with the special contribution of the Heart Failure Association (HFA) of the ESC. Eur Heart J. 2016 Jul 14. 37(27):2129-200. [Medline]. [Full Text]. Ryan TD, Madueme PC, Jefferies JL, et al. Utility of echocardiography in the assessment of left ventricular diastolic function and restrictive physiology in children and young adults with restrictive cardiomyopathy: a comparative echocardiography-catheterization study. Pediatr Cardiol. 2017 Feb. 38 (2):381-9. [Medline]. CT = computed tomography; LVEDP = left ventricular end-diastolic pressure; MRI = magnetic resonance imaging; RVEDP = right ventricular end-diastolic pressure; RVSP = right ventricular systolic pressure. The authors and editors of Medscape Reference gratefully acknowledge the contributions of previous authors Sarath Reddy, MD, Alan Forker, MD, Gunateet Goswami, MD, Nafisa Kuwajerwala, MD, Paul J Kaloudis, MD, and Andrew Wackett, MD, to the development and writing of the source articles. The Remarkable Story of a Wonder Drug, Which Now Comes to an End in the Primary Prevention Setting: Say Bye-bye to Aspirin!